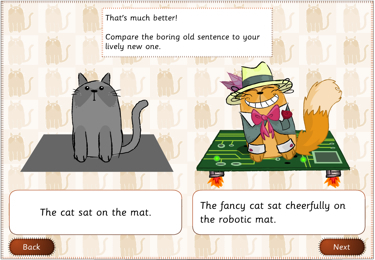 Add descriptive words to two simple sentences about a cat and a fish to make the sentences more interesting. Substitute different descriptive words in each sentence. Notice how your choice of words affects the animations for the sentences. Use your two lively sentences as the start and ending of an imaginative story. Check your word choices to see if the story could flow better. Then complete the following extension activities: describe a pet-related image; use a new set of words to create another vivid sentence; extend your story about pets. Allows students to substitute adjectives and adverbs in sentences and see the impact of the changes.